Count Basie : Big band charts from the Count Basie Orchestra. 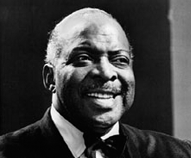 A range of big band arrangements made famous by Count Basie and his orchestra. Born William James Basie, he was a pianist, composer and band leader responsible for an endless stream of jazz hits over a sixty year career. Basie left school at 15, formed his own band around the age of 30 and led it until his death in 1984. What are the famous Basie charts you'd know? Basie''s early band style was all about blues based head charts. His signature tune "One O'Clock Jump" began life as a band improvisation. His use of outstanding soloists such Lester Young and Dickie Wells gave us "Lester Leaps In" and "Dickie's Dream". The Count Basie Orchestra had many hits including "Swingin' the Blues"", "Avenue C", "920 Special", "April in Paris", "Li'l Darlin", "Whirly Bird" and "Corner Pocket" . Many of his early charts were penned by himself, Eddie Durham and Buck Clayton. His later successes were largely the works of Neal Hefti and Sammy Nestico, and Basie's best known album was cut in 1958 - "The Atomic Mr Basie". Over the years his band featured vocalists such as Billie Holiday, Joe Williams and Jimmie Rushing.